OH DEAR, I frankly don’t know how it happened. I know I’ve written–and meant–many times that I would be able to spend more time in this space. I love to share my recipes, stories, and photos. But the reality is that I am simply struggling right now to fit it all in my days. This is one of these times of my life when I have to accept that I can just do what I can. In the meantime, I am still cooking and styling and photographing food. It’s a big piece of what makes me happy in life. Making and sharing food with my favorite people, my friends and my family. And of course, I am working really hard at finalizing details for my upcoming workshops in Paris and England. And also–and mainly–finishing the manuscript of my book. I am supposed to be done by the end of April–and the book should be released in the fall 2015. So bear with me. I know there will be better days when I don’t even know what to do with my time. Anyway, I thought I would just come to let you know, in case you wondered. Today, for example, I cooked these petits pots de crème à la vanille. They are a staple at home. I could not imagine a simpler dessert, yet one that is oh so delicate and delicious. For grown-ups and children alike. These look absolutely lovely. I have been dealing with the same problem lately – not enough time in my days to do all that I wish to do! 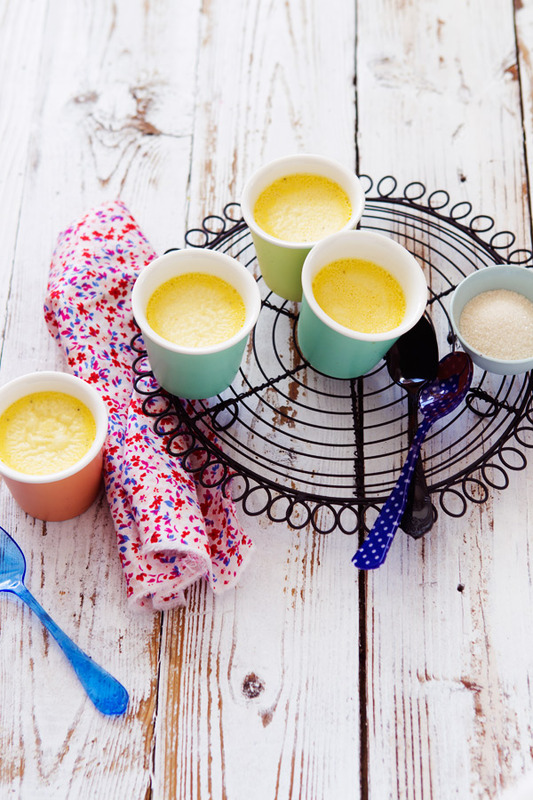 Oh well, I’m certain that I can make time for these little luscious pots de crème! knowing your last book nearly by heart now, I’m soooo happy that you managed to give food to your blog 🙂 I missed it!! I so relate with you… the more I love my space, the more I would love to write, the less time I have..
Il faut parfois savoir mettre de côté certaines choses poir mieux les reprendre plus tard. Cette pose pour toi se soldera par une petite surprise pour nous en 2015. Je vais attenndre avec impatience ton nouveau livre et tes posts prochainement. Bon travail et à la prochaine! Beautiful Béa! Looking so forward to your new book release! Life goes through ups and downs. I think that’s what makes your work so precious and beautiful! We creatives often make it look like “play” and all easy… but in reality it’s hard work. Hard work we adore (mostly!) but work nonetheless. It’s impossible to find enough hours in a day. I’m in the same spot, and hope you can give yourself a permission slip to lead a balanced life once the most pressing deadlines have passed. We do need enough sleep, brisk walks and hours in the garden. It fuels everything else. Deadlines now, and there will be a few hikes and afternoons away soon. And if you finish your book in time to wander north to see the Skagit Valley tulips next month, you will have your breath taken away! I’ve got bikes you can borrow- bring a picnic, it’s a stellar impromptu photo shoot. I’ve been looking for your posts, but figured you’ve been out of town. Don’t worry – your fans won’t desert you! You are human! Love what you do give to your audience. Thank you. I was a silent reader so far, but I think your blog is adorable. I just startet to blog and I can already see the feelings you described ahead. It can be so hard to find the right balance. Thank you for sharing your thoughts!